So it’s come to this. 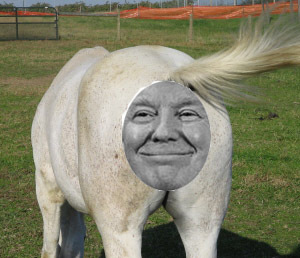 We Americans have gotten so bent out of shape and royally pissed off at the general state of affairs lately that both the American Psychological Association and the American Heart Association are having giant cows about the giant cows we all seem to be having. The term “don’t have a cow” doesn’t even cut it anymore—we’ve all already had our cows, and they’re all out there mooing, blocking traffic, fouling the landscape, and indiscriminately flipping their middle hooves at anybody who passes by. In short, we’re all about one bad day away from busting a major artery or two. Earlier this year, the American Psychological folks released their annual survey of stress in America, and the results were so off-the-chart bad that the spokesperson couldn’t even finish the press conference. 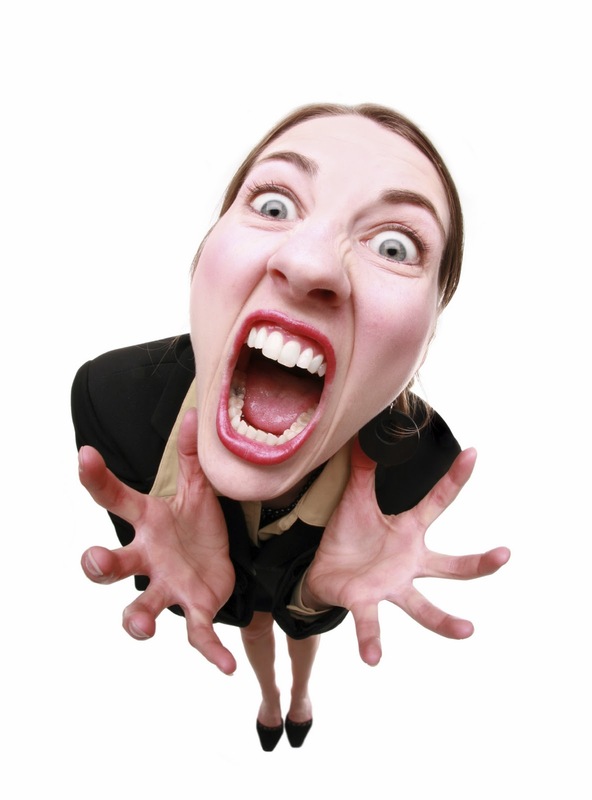 Just after announcing that for the first time in its history, the survey found a statistically significant increase in U.S. stress levels compared to the previous year, the poor spokeslady clutched her chest, wheezed like Redd Foxx in the throes of “the Big One,” and fell to the floor. The cause of all this stress? I’ll give you three guesses, but here’s a hint: Every answer rhymes with the word “dump.” Despite the tantalizing opening here for a scatological joke or two, I’ll refrain. Suffice it to say, as the American Psycho folks noted, “The most commonly shared explanation for this nation’s unprecedented stress levels involves the country’s extreme political polarization.” Again, in results never seen before, almost 60 percent of people surveyed for the study said the current political climate was a “very significant” or “somewhat significant” source of stress. Also on board with the APA’s findings, the American Heart Association, alarmed at the recent spate of people keeling over left and right with massive coronaries, set up—get this—a Scream Booth in downtown Austin a few weeks ago. “Step in the booth, identify your stressors, and scream out your frustrations for a quick burst of stress relief and fun,” the American Heart guys wrote in a press release. They also recommended getting enough sleep, trying meditation, and “practicing mindfulness” (whatever that means), but the heart folks felt that stepping into a booth and yelling your lungs out for a minute or two might take the edge off just a little. I, for one, am all for it. In fact, this kind of physical release really does help, if my own personal experience is any indicator. Me being an avid Texas Longhorns fan, I’ve found that opening the back door and screaming my brains out after a particularly bad ’Horns play does wonders for the ol’ blood pressure. The only problem here is, the way the ’Horns have played so far this year, all my backyard neighbors have had to pack up and leave town every Saturday. Oh, and Lloyd Braun is right. 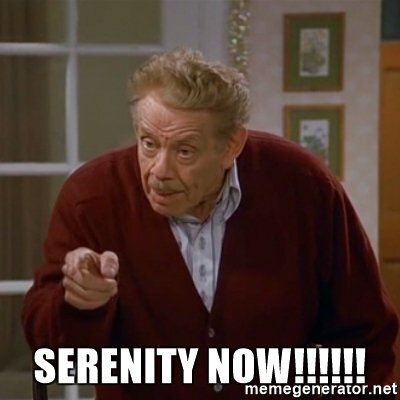 Frank Costanza’s “SERENITY NOW” doesn’t work. Just a tip. You know what does work, though? Turn off the news. I highly recommend watching reruns of “The Andy Griffith Show” and any old Warner Brothers cartoon. And Patron over ice. Roger White is a freelance human living with his lovely spousal human, two precocious offspring humans, a very obese but mannerful dachshund, and a very dour cat with Epstein-Barr Syndrome. For further adventures, visit oldspouse.wordpress.com. Or not. Only 60% ? Those damned shrinks. What do they know, anyway?